I have looked into the night sky and seen the dark moon, and I have thrilled to know that my eyes were among the few eyes that could see it. I have heard the voice of the god Nuitari and reveled in his blessed touch as I cast my spells. Long ago, the magic breathed and danced and sparkled in my blood. Now it crawls out of my fingers like maggots swarming from a carrion carcass. I would rather be that corpse than be a slave to one who so fears the living that she can trust only servants who are dead. Hang on to your hats…it’s gonna be a helluva ride…! Things start coming together early on. On one front, the blind silver dragon Mirror (formerly of the Citadel of Light) teams up with the blue dragon Razor (formerly dragon-mount to Marshal Medan) to find out the full story behind Mina and her One God. The Knight Gerard infiltrates Mina’s army to learn her plans, while the Knight Odila is out to find more about the One God (amazing how many people want to know that, eh?). Gilthas is busy leading the Qualinesti across the plains towards Silvanesti, not realizing that they’re dealing with their own problems at the moment…including a leader who’s gone missing (although certain elves-and most readers, undoubtedly-know where he’s gone). And then there’s Tasslehoff, once again playing with toys that he probably shouldn’t, whose activities gather the attention of…well, let’s just say they’ve been looking around for a long time now. I was glad to see that Galdar the minotaur, who didn’t get all that much time in Dragons of a Lost Star, gets a great deal more time in this one. A certain former archmage also makes a couple of appearances, where least expected. And thanks to Tas, we get a chance to see again other important characters from Krynn’s past, including (in my opinion), the most feared being to ever walk the face of Krynn. There’s also a wonderful cameo appearance by a group from the other Dragonlance books that Weis has been associated with. It’s safe to say the conclusion of the War of Souls sets up a new status quo for the Dragonlance saga, as Weis and Hickman have shaken everything up just as badly as they had with Dragons of Summer Flame. They also close the book on just about all the original Dragonlance characters in one way or another, leaving the slate clean for any characters they wish to develop for the future (or characters from other authors; I’m not sure what’s next for the Dragonlance franchise). 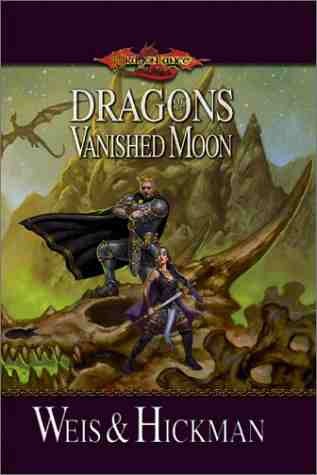 Dragons of a Vanished Moon does not disappoint in reader satisfaction and I highly recommend this book (and indeed, the War of Souls as a whole) to any fan of “high” fantasy.